As a 24-year-old full-time musician in a city notorious for its relentless pursuit of the fountain of youth (LA), I must confess to a certain anxiety about my age (it's not decreasing!) and its relationship to my career and craft. I have a hunch I'm not the only one; after all, conflicting messages about music and age abound. On one hand, I hear plenty of older musicians say that it's nearly impossible to achieve musical maturity until well into middle age. "You have to have lived life before you can play," they say. 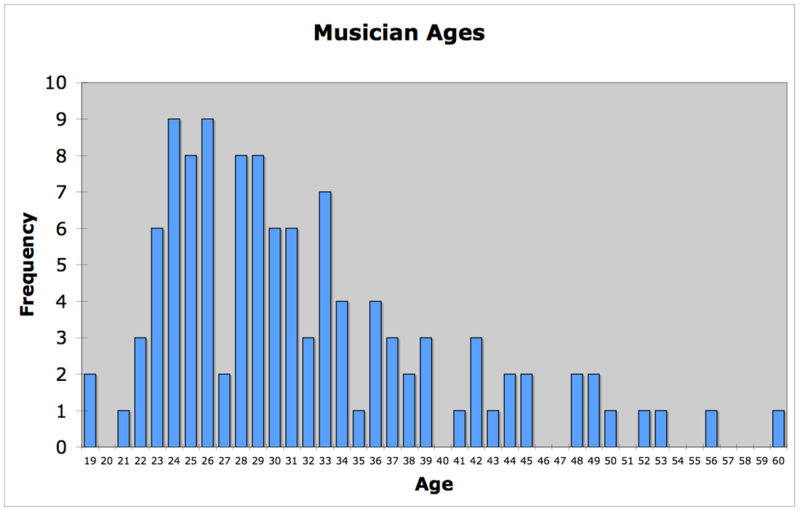 On the other, the reality is that the majority of today's most successful musicians are in their 20s or younger. I'm not just talking about tween pop idols, but jazz, R&B, indie, and even classical artists. What's going on here? To what extent is the success of young artists attributable to their musicianship versus the industry's infatuation with their youth? To try to shed a little light on these issues, I chose my favorite 17 jazz, pop, and R&B albums and collected the ages of the musicians involved in each. To the furthest extent possible, I included all artists, sidemen/session players, and producers, for a total of 116 musicians. It would have been very interesting to include the songwriters and arrangers, but it was too difficult to track down their ages at the times they wrote the music in question. 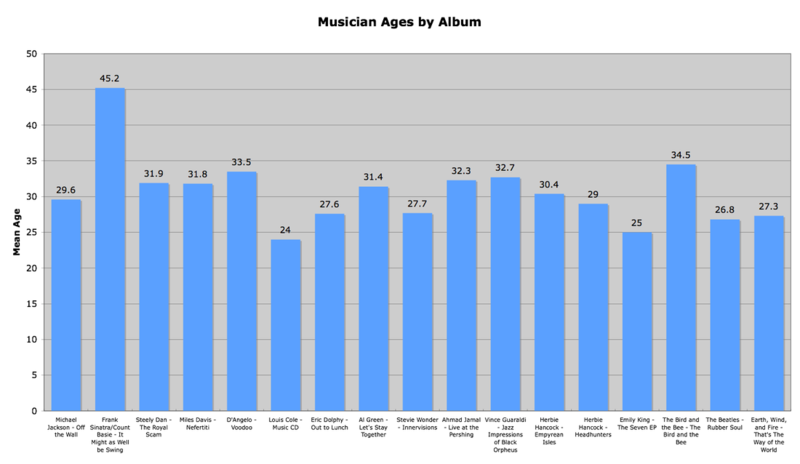 Here's the graph representing all musicians on all the albums. The mean age is 31.8 and the median age is 30. Note the spike at around 24-26, followed by the long tail that dwindles by the early 50s. If you're in your 50s or beyond, don't despair - you're in the good company of Count Basie, Marshall Royal, and Freddie Green! The record with the youngest musicians (not counting albums with only one musician) is The Beatles' Rubber Soul, with a mean age of 27. It would be 23.8 if not for George Martin! The record with the oldest musicians is Frank Sinatra and Count Basie's It Might As Well Be Swing, with a mean age of 45.2. And here are the numbers by instrument. "Artists" are also counted on the instrument they perform. Not surprisingly, the oldest are the producers, with a mean age of 39.8. 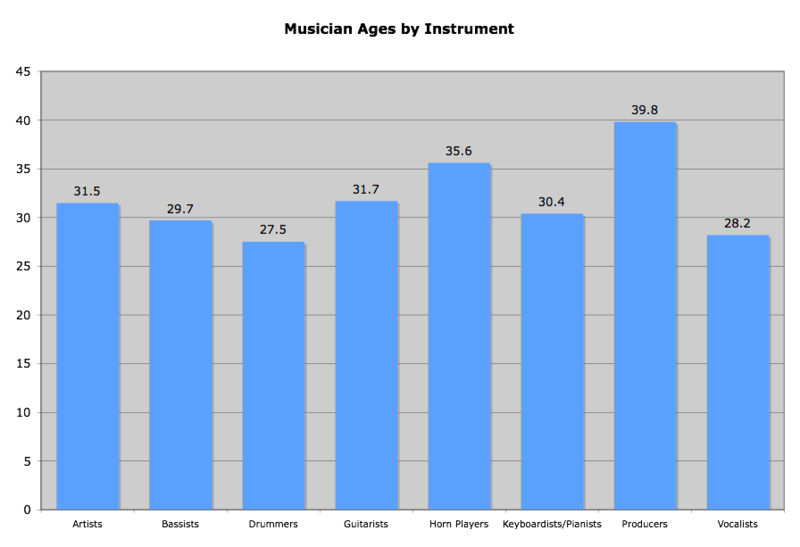 Drummers are the youngest; they showed a mean age of 27.5. What can I make of this? I want to be clear that this exercise is not intended to or able to "unearth the prime creative years for musicians" or anything sensational like that. My sample is my own. It is tilted toward the famous and successful, who even several generations ago were more likely to be young. However, I don't feel out of line in making some general observations here. First of all, it seems that the popular music I like is a young man's game. But there is also plenty of room for involvement by middle-aged men. And I do mean men; only 1 woman, Emily King, is in my sample (this was a little unsettling to me and is certainly food for thought). And the numbers do vary by instrument, but only by about 10 years either way. It raises more questions for me, too. What about the ensembles I love that were just too big for me to collect data? Sinatra-Riddle albums, Ella Songbooks, and Thom Bell productions come to mind. What about pre-album jazz, which I only omitted because it was too hard to pick individual tracks (Blanton-Webster Ellington band, I'm thinking of you)? What about classical music? Why did so few women make it onto my list? Not to mention the issue of longevity! I was torn regarding whether to represent Steely Dan with The Royal Scam (1976) or Two Against Nature (2000). Why have they created music of such consistently high quality across decades, where some have petered out in 5 years? What do you think? Have you ever tried this sort of thing with your own favorite records? Of course, general comments on age and the music industry are welcome too. The full spreadsheet, which includes the raw data, more histograms, and medians, is available upon request at my contact page here.